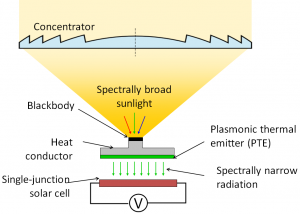 The spectral mismatch between the broad solar spectrum and the narrow absorption spectrum of a single-junction semiconductor solar cell is the principal reason for the low energy conversion efficiency of solar cells (theoretically ~30%). Large research efforts have been invested, in order to broaden the absorption band of semiconductors for solving the the spectral mismatch. One example would be a multiple junction solar cell made by stacking several different semiconductors having different absorption spectra. The completely opposite design is also possible, which is to narrow the solar spectrum. Of course, we are not going to replace the Sun, but rather, we will use a Plasmonic Thermal Emitter (PTE) to convert the broad solar spectrum into a near monochromatic one. PTEs are generally a 2D or 3D periodic structure made of a metal in order to excite plasmonic resonance modes, and thereby spectrally narrowing the thermal radiation from the PTE in contrast to the broad blackbody radiation. 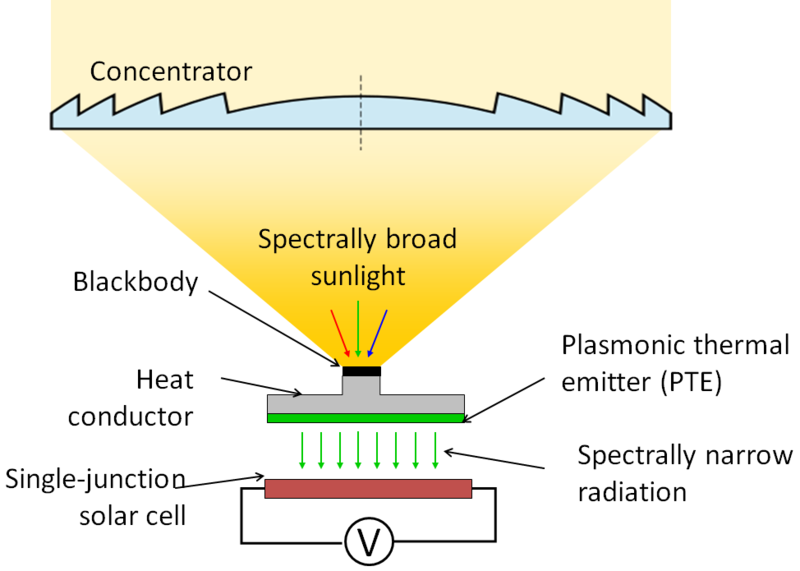 As shown in Fig.1, the entire solar spectrum is absorbed as heat and the PTE re-emit a tailored thermal radiation at a high temperature. This thermo-photovoltaic (TPV) approach can open a new way to achieve extremely high efficiency in photovoltiaics (theoretically ~85%) far beyond the theoretical limit of single-junction solar cells. Fig. 2 The measured radiative spectra of a planar and a 3D metallic structure are shown with the Blackbody radiation spectra. Lee, J.-H. et al. Adv. Mater. 19, 791 (2007); Lee, J.-H. et al. Adv. Mater. 20, 3244 (2008). The measured thermal radiation spectra of PTEs demonstrated the engineered thermal radiation characteristics depending on their geometries (Fig. 2). The radiation spectra at different temperatures (color curves) have temperature-independent narrow radiation peaks while corresponding blackbody radiation spectra (black curves) show temperature-dependent broad peaks. Moreover, clearly the 3D PTE enables higher enhancement than what the planar one does due to its stronger plasmonic resonances. In order to achieve high conversion efficiency, a PTE needs to be operated around the optimal temperature approximately given by the Wien’s displacement law (Fig. 3). Since the optimal temperature ranges from 600 to 1,500K, critical challenges lie in the optical and structural behaviors at the high-temperature. 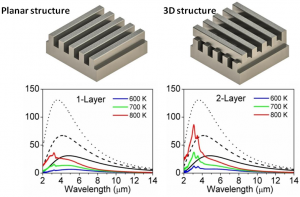 In this project, we are trying to solve various material issues such as optical and mechanical behavior of nano-structured metals at the high temperature range. To realize the PTE-based solar cells, systematic designs, scalable fabrication processes, and characterizations of the PTEs are carried out. 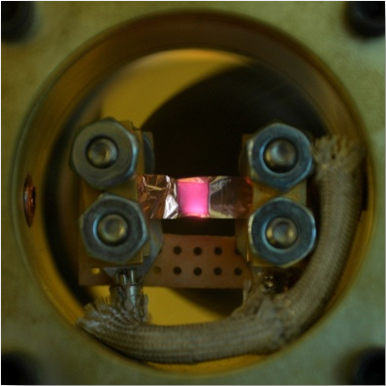 Fig.3 A plasmonic thermal emitter in vacuum is heated by Joule heating for radiative characterization. Advanced Materials 20, 3244 (2008). Optics Express 16, 8742 (2008). 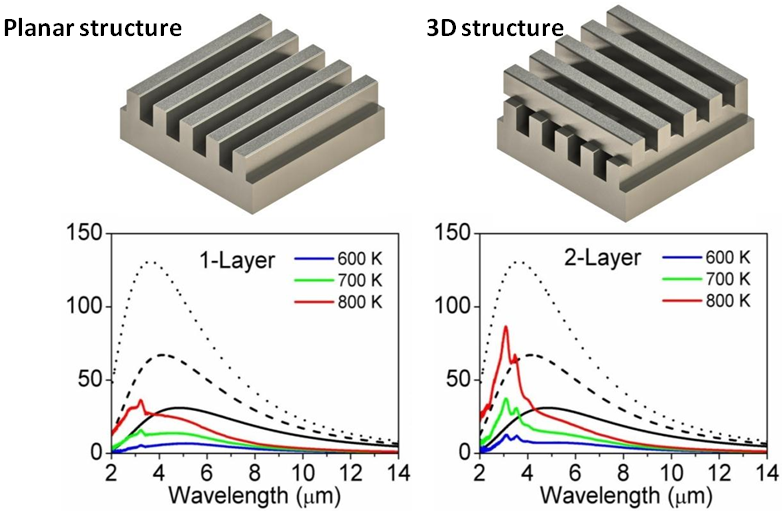 J.-H. Lee, Y.-S. Kim, K. Constant, K.-M. Ho, “Woodpile metallic photonic crystals fabricated by using soft lithography for tailored thermal emission” Advanced Materials 19, 791 (2007).